He's sitting in second for the final round at the Northern Trust. 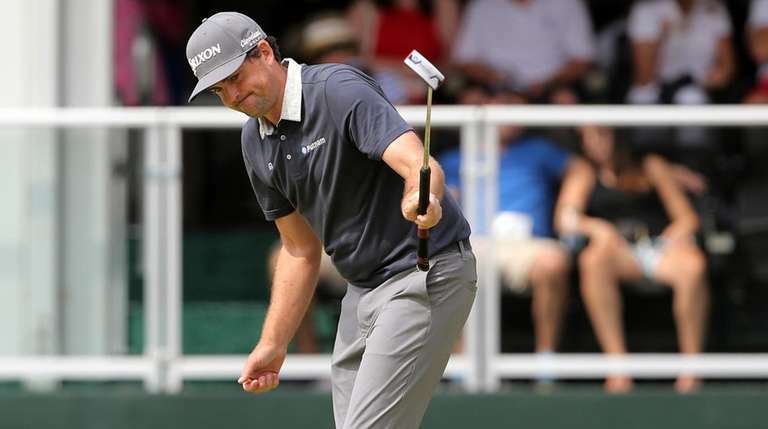 PARAMUS, N.J. — Keegan Bradley finally is back where he was born to be. He is right in the mix at a big tournament, near the top of the leaderboard and delightedly getting cheered and razzed by New York fans. In other words, he is home. He looked it, walking with that trademark bouncy gait as he tied the Ridgewood Country Club record with a 9-under-par 62 and briefly took the lead in the Northern Trust. He also felt comfortable in hearing from St. John’s college buddies and other supportive types as he played one of the best rounds of his life. We’ll say. When Bradley was a dynamo for the U.S. in the 2012 Ryder Cup, he had the metabolism of a sparrow and the tenacity of a Doberman Pinscher. At the time, he was one of the game’s finest young stars. He had won the first major in which he ever had competed, the 2011 PGA, as well as the 2011 Byron Nelson and 2012 Bridgestone Invitational. But the 32-year-old Vermont native has not won since then and never was in the mix for the Ryder Cup teams in 2016 and this year. He has been around, hidden in plain sight. It is easy to blame it on the forced shift away from the anchored putting style, given that he was the first ever to win a major while using a belly putter. That method was outlawed in 2016, with Bradley complying more than a year early. The problem he encountered was that the ban was announced in 2012, while Bradley still was using it. People accused him—sometimes blatantly and loudly during tournaments—of being a cheater. He was nothing of the sort, but the words hurt. Nobody knows how much that affected his game, but the fact was that without Bradley in the mix, golf was without one of its most ebullient characters. So, it was fun for him and rewarding for the rest of us to see what happened Saturday: three birdies in a row, five in the space of seven holes on the back nine. His 62 tied a mark set in this tournament [then known as the Barclays] 10 years ago by Hunter Mahan, who had edged a 62-year-old record 63 set by a Ridgewood assistant pro named Byron Nelson. “A lot of times when you go out and shoot a really low number, coming in, you can feel a little pressure. For whatever reason, I didn’t feel it. I felt calm the whole way around,” he said, having been amused by the jibes from Yankee fans who know he is a Red Sox diehard. It was like the calm of a person sitting in their own living room. “I personally think this Met area has some of the best golf in the entire world,” he said. His golf is a product of the days when he and fellow Red Storm golfers would be allowed to play Bethpage Black when the course wasn’t open. And when he got to play all the time while working in the bag room at Wheatley Hills. He keeps up. He knew that fellow St. John’s graduate Andrew Svoboda won the Long Island, New York State and Met Opens [“He has always been one of the best players I’ve ever seen,” Bradley said]. Plus, he is putting well again, this time with a short putter. Lately, Bradley again has felt like the kid who won the 2011 PGA. He believes he can again be one of the guys worthy of the Ryder Cup. Bradley will enter the final round, second to Bryson DeChambeau and right in the hunt. It should be a good show. When Bradley is in the mix, nobody gets cheated.